We have been very blessed this year with doelings. 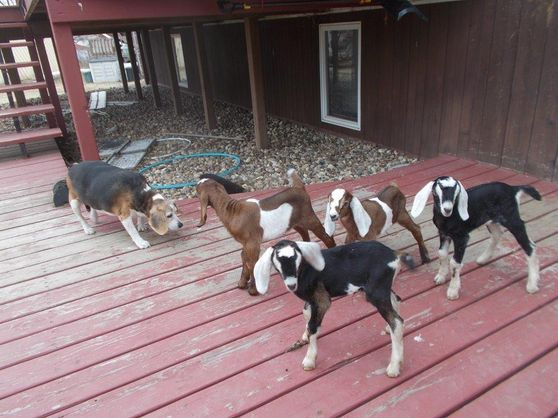 Four does had ten kids: 9 doelings and 1 buckling. I think we were meant to be on milk test. All their mothers are on milk test, so these doelings will be eligible for milking stars if you choose to test. We weigh each doe's production at every milking and serious buyers are welcome to check those records. Below is a listing of our 2015 kids. They are all SOLD or RETAINED, but give you an idea of what's coming for 2016. All doelings are sold with registration pending and a bill of sale. 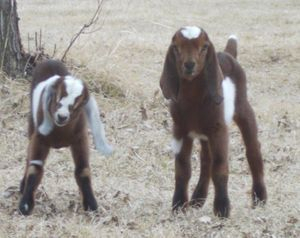 Doeling prices start at $300 with a discount for 4-H & FFA members. These does will be serious milkers. 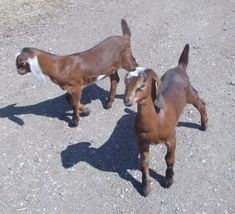 Please note: If you see a doeling that's "reserved" or listed as "sale pending," well, no money has changed hands yet. 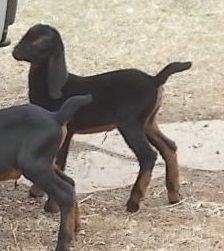 Things do happen, so if that's the doeling that has won your heart, let me know and I can contact you if the sale falls through. Rupee is a first freshener that’s a delight to hand milk – just like her mother and the grandmothers on both sides. She has nice-sized teats and a soft as a glove udder. Rupee is an easy keeper and both sides of her pedigree have does with long, level lactations. Rupee is on milk test and should earn her star this year. If you choose to milk test these girls, they are potentially 2 Star does. FIRST DOE - Unfortunately, a heart defect claimed the first doeling within a few days of birth. The two remaining kids are strong, sturdy creatures. Born as a set of triplet does, Collette is a smart young doe with great width from her chest to her rear legs. 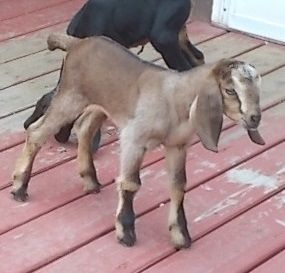 Collette loves to learn new things and would be a delightful doeling to show. She does have a voice – with so many variables, you almost think she’s actually saying words. She lets you know her opinion. The largest of the triplets, Shekel has great width from her chest to her rear legs. She naturally stands with plenty of room to carry a large udder. She has lovely breed type and is oh, so smooth overall. Shekel is on the right with Collette on the left. See updated photos and information in our Junior Doe section. Mony is my herd queen with wonderful size, stature and boning – plus a great personality. She comes from long-lived lines with the ability to produce milk for extended (more than a year) lactations. 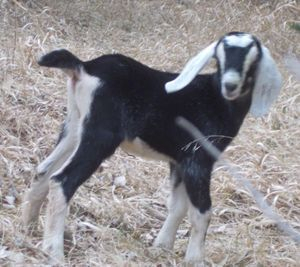 Paco comes from the West Coast from a nationally-known breeder and has wonderful LA scores, milking stars and national winning goats in his pedigree. His wonderful type is matched with a friendly, easy-going personality. When Dimples was born I knew she was a keeper. 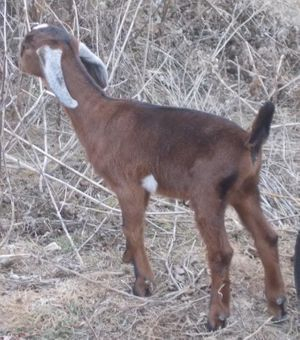 Her wide stance, straight structure and great bloodlines are perfect for Harner Farm. She's bred to have a great udder and long lactations. See updated photos and information in our Junior Doe section. This second Mony daughter was a bonus. Teri is sweet and lively with just a bit shorter stature than her sister, but perhaps a teeny bit more width. She’s gone to live with a 4-Her who I know will cherish her like the very special doeling she is. Cherry is a little on the short side, but has great width and capacity and is an “easy keeper.” She easily milked a full year on her first lactation with me without much loss in body condition and wasn’t affected by cold weather. This year she’s already had one day producing 14 pounds (7 quarts) of milk – albeit that was with three times a day milking. This gorgeous sweet red and white buckling unfortunately has fishtail teats and had to be wethered so he doesn’t pass on that trait. He’s solidly built and has a sweet and loving nature. He’d be a wonderful companion to a doeling or combined with another wether as a pet. 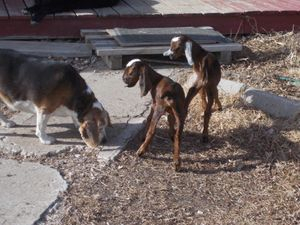 Here's Sparky in front with his sister following behind. Born twin to a buckling, Sparkle took one breath and never looked back. She inhaled her bottle right from the start and quickly outpaced her brother at the milk bar. I sometimes refer to her as “Cherry Chunk” because she’s as solid as they come. While her mother Cherry is a little on the shorter side, she has great width and capacity and is an “easy keeper.” She easily milked a full year on her first lactation with me without a loss in weight. Cherry’s mother is a 1Star milker, so Cherry could be a 2 Star and Sparkle a 3 Star milker if you choose to go on milk test. was smaller than her brother. 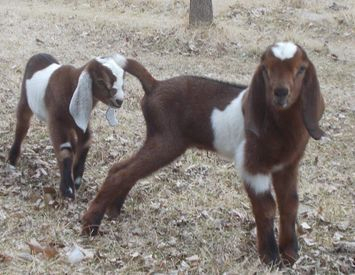 Until this year, Star had only produced bucklings, so getting triplet doelings was a delightful surprise. These three nearly solid does are long, smooth, and very, very wide in both stance and body. Starting with beautiful, typey Nubian heads and long, lovely ears, your eye moves to those wonderful wide shoulders and width in the chest. Then you have long bodies that will hold babies and plenty of food with good width in their hips to allow easy delivery and plenty of room for full udders. As a first freshener, Star produced over 2,000 pounds of milk in a 12 month lactation – and I had to work to dry her off. Last year she peaked at 12 pounds (6 quarts) of milk in a day. Atlas comes from the same type of production and a long, tall, typey doe. These young ladies will grow and grow. The smallest of the trio – Dixie never let size stop her. She’s bright and ready for anything, but loves to be cuddled and babied. 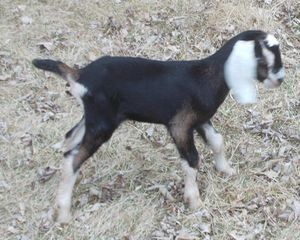 Here she's pictured at just two days old. The third doe – Lanie came out with a certain self-possession she’s retained. As a newborn, she laid in the straw with her legs tucked up underneath her and held her head up, watching her mother and siblings. She is very quiet, but also very bonded to people and loves to cuddle. 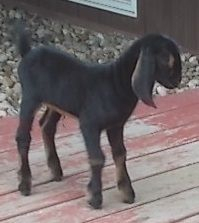 Have you ever tried to photograph a black baby goat? First, they're perpetual motion machines and then the black blends and blends. Lanie has two small brown stripes on her face which gave her a name. Cinder’s face and body are almost completely black with a couple of small brown spots by her eyes and some brown fringes on her underside and legs. She’s the largest of the triplets and very quiet. She's just two days old, but look at that gorgeous head and ears, plus wide stance. Cinder could be the belle of your barn.